If the Chicago Bears were continuing to harbor illusions that they were a playoff contender, those dreams were dashed to bits on Sunday as they lost 24-21 at Soldier Field. To help break down what went wrong, we’re breaking out our red pencils and giving the team a report card to document their performance against Washington. All year long the common refrain has been that the Bears’ offense has been efficient and that Jay Cutler has been put into a position to win games for the team. Needless to say, that narrative took a hit on Sunday as they did just about every conceivable thing wrong. The offensive line had difficulty blocking, allowing Cutler to get chased from the pocket with ease and even leading to a turnover as Kyle Long blew a block badly against Trent Murphy. For the second week in a row, screen passes were blown up at the line of scrimmage, leading to punts. Perhaps worst of all, the team’s play-calling was awful when it needed to be at its best. After Cutler threw a long completion to Alshon Jeffery during the final minutes of the game, the Bears opted not to try to gain extra yards to at least threaten at the end zone, or at the very least to try to give Robbie Gould a shorter field goal to kick. Instead, they opted for a single run with Matt Forte and then threw deep passes to Jeffery (which Cutler underthrew) and to Eddie Royal, who was also underthrown. Those set up the missed 50-yard field goal by Gould, and the Bears went on to lose the game. It was a comical display of bad judgment by Adam Gase, and the poor execution of his players only made it worse. People will point to the 24 points and the long drives that the Bears’ defense gave up in the game and say that they should be punished for that, but the reality is that this group was the only thing that helped keep Chicago in the game on Sunday. Sure, their cornerbacks were way too soft in coverage, giving up completions to help protect the safeties that had been burned on the final play of last week’s game against the San Francisco 49’ers. Sure, their linebackers couldn’t cover passing plays and allowed Jordan Reed to wreak havoc on the team all afternoon. 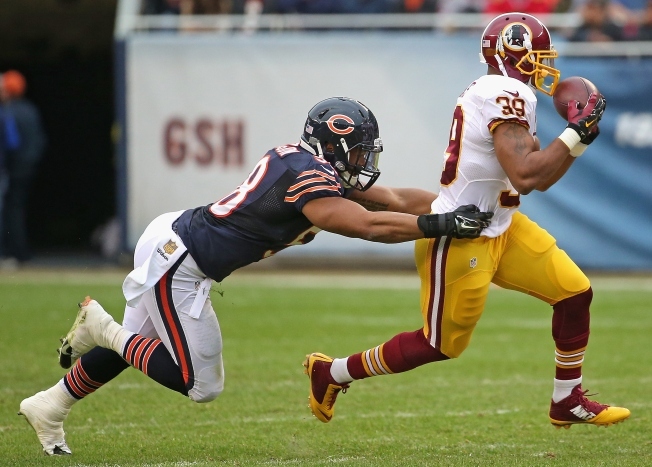 Even with those failures, the defense still managed to hold things together late, and it was largely because they were finally able to generate a big turnover when needed (Kyle Fuller’s interception), and they also were constantly getting in Kirk Cousins’ face late in the afternoon, as Willie Young and Eddie Goldman continued their outstanding pass rushing performances. There is still plenty that needs to be cleaned up about the Bears’ defense, but even with players having bad games all over the field, they still made some plays and kept the Bears in what could have otherwise been a complete blowout. Plenty of times this season the Bears have had a rough time on the special teams side of things, but Sunday was an exception to that rule. They didn’t do anything overly stupid, Pat O’Donnell punted the ball decently well, and Marc Mariani and Deonte Thompson didn’t screw anything up in the return game. The reason for the low rating can be summed up in two words: Robbie Gould. The Bears’ kicker had a golden opportunity to make up for his failures against the 49’ers, but instead he pushed a kick right and cost the Bears yet another opportunity to win. That simply cannot happen when you’re one of the highest paid kickers in the league, and yet it’s happened two weeks in a row.